Spacious apartments built for quiet, security and elegance. 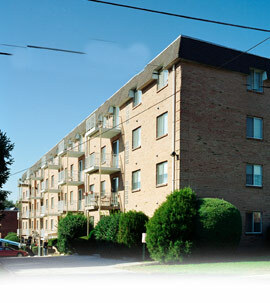 Lindenwood North is the type of beautiful elevator apartment building that is outstanding in every respect. Quality soundproof construction, plus the security features you want for yourself and your family. The location of Lindenwood North is superb. The Penn Central train station, plus high speed trolley and bus stops are just minutes away. Churches and many excellent shopping areas are just a few minutes away. With all the features, location, quality and elegance you'll want in an adult apartment community-make Lindenwood North your next address and you'll never be sorry. From Baltimore Pike, turn west at the K-Mart on Burmont Road and continue to Shadeland Avenue, right on Shadeland to Lindenwood Apartments or from Garrett Road turn east on Shadeland Avenue to the Apartments.